„Magazynowanie i Dystrybucja” magazine nr 4/2013 featured an article titled „ Proven in a thousand implementations”. Vanderlande Industries – solutions which cater for the most demanding challenges faced by distribution centres today. Increasing work costs, limited availability of the storing area, increasing number of small orders with a short delivery period – these are only some of the challenges that warehouse and distribution centres need to face nowadays. Still solutions are being looked for which could limit operational costs, increase productivity, optimise the use of warehouse space, and provide a high level of services. Offer of Vanderlande Industries is a response to all those needs. The following article presents a couple of innovative systems provided by this supplier. Vanderlande Industries is a leading supplier of automated warehouses and sorters for distribution centres and which managed to implement more than a thousand implementations in various sectors all around the world (including many of them in Poland). Thanks to their in-depth knowledge about the processes taking place during storing and performing tasks connected with distribution, Vanderlande Industries can propose very competitive and application-flexible systems to be used when accepting goods to a warehouse, its storing, order picking, consolidating parcels and shipping them. Automated storage and retrieval systems (AS/RS) are the key technology in the contemporary warehouse logistics bringing benefits in respect of executing many warehouse processes: storing, completing orders, and consolidating dispatches. AS/RS systems allow to increase the storing density by 60%. The AS/RS system of Vanderlande Industries is provided under the QUICKSTORE brand. This system cooperates with various stacker cranes. 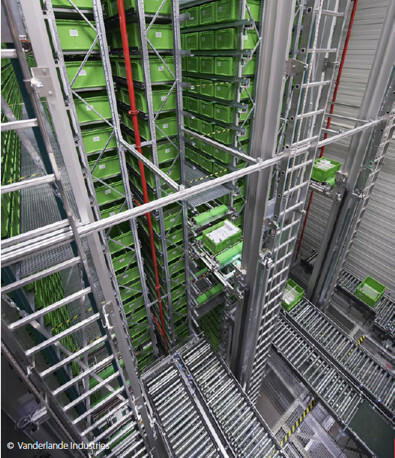 Elements of the QUICKSTORE system are developed and produced by Beween, a company owned by Vanderlande Industries and which currently is the leading European supplier of automated storage systems. The Microshuttle solution allows to transport trolleys bearing loads at various levels of warehouse shelves using an elevator. This type of system is called “roaming shuttle”. Trolleys are fed with energy collected in condensers which are assembled on them and feature high capacity and are controlled wirelessly. Every Microshuttle-type system is highly scalable – it can develop along with the needs of a company using this type of solution. Along with an increase of demand for capacity, individual trolleys of stacker cranes can be added individually. Completion of orders constitutes up to 60% of storing costs. Fast and accurate implementation of orders has also direct impact on the level of client’s satisfaction. Automated orders completion system can increase the productivity of up to 1000 items computed per one working hour, at the same time improving the accuracy up to 99.99% and allowing to increase the client service level. Selection of the completion system, the best taking into account a specific business sector, depends on product’s parameters and type of operations carried out in the course of the entire process. Vanderlande Industries holds a wide offer of orders completion systems for products stored in bulk, in cases, and on pallets – including completion systems in packing zones, goods-to-man systems, and batch picking systems, up to fully automated goods completion systems in cardboards and cases. Companies more and more often want to provide their co-workers with friendly work environment, at the same time remembering about attaining high level of productivity and such organisation of the work station which will allow to quickly learn its operation. Taking into account how critical a factor in attaining high level of employees’ commitment is proper designing of the working station, Vanderlande Industries developed a series of working stations @EASE. They have been designed so that by maximising work ergonomics it would be possible for the operator to maintain a high level of productivity for the entire period of this post’s service. One of the solutions offered within a series of @EASE work stations is PICK@EASE. Within the scope of the process implemented using this workstand, products stored in plastic containers having standard dimensions are collected from warehouse shelves by the automated storage system AS/RS and supplied to the operator using a conveyor line. The operator takes a proper number of products from the container and places them in another standard container, assigned to a respective order which is in course of picking. The post of the operator plays a key role in this type of system. One order picker at the PICK@EASE work station can replace up to 9 traditional operators. This system improves also the effectiveness of the entire warehouse as in majority it increases the accuracy of order picking, guaranteeing that the recipient will receive a given order in due time. Design of the PICK@EASE post was prepared in close cooperation with TNO – the biggest European institute running surveys and rendering counselling services in respect of ergonomics. More information about the offer of Vanderlande Industries can be obtained by contacting the AMSORT company which represents Vanderlande Industries on the Polish market.